This topic contains 0 replies, has 1 voice, and was last updated by James Haldas 1 week, 2 days ago. Some iDVR-PRO CCTV DVRs support advanced RAID hard drive configurations. RAID hard drive configurations can ensure a reliable backup of your recorded video surveillance footage. In this article we will be going over and giving a brief explanation of our iDVR-PROH Series DVR RAID feature. The iDVR-PRO DVR supports RAID 1 and RAID 5, please see short explanation of RAID 1 and 5 below. RAID 1 : The recorded data is stored / duplicated on 2 internal Hard Drives. You will need at least two hard drives to use this feature. 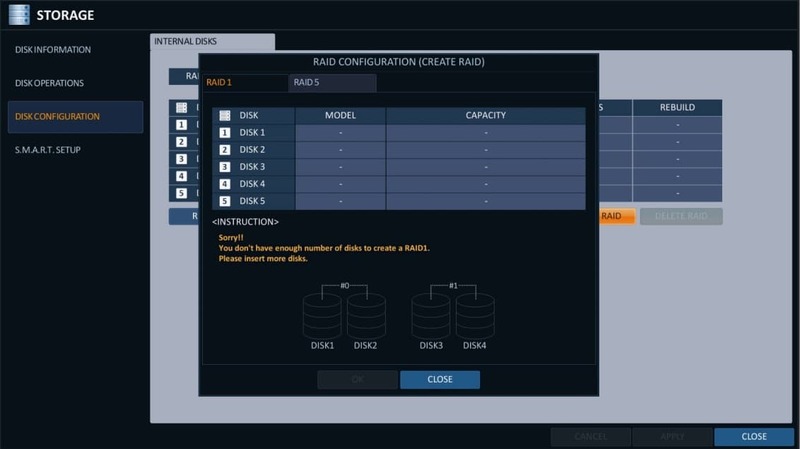 RAID 5 : This mode is the best known as RAID array. It distributes and stores data and parity across at least 3 drives. You will need at least 3 drives to use this feature. 2. Select the RAID 1 or RAID 5 tab at the top of the pop up window > Select your drives and click the OK button once drives have been selected. Still not sure which RAID option is best for your CCTV application? 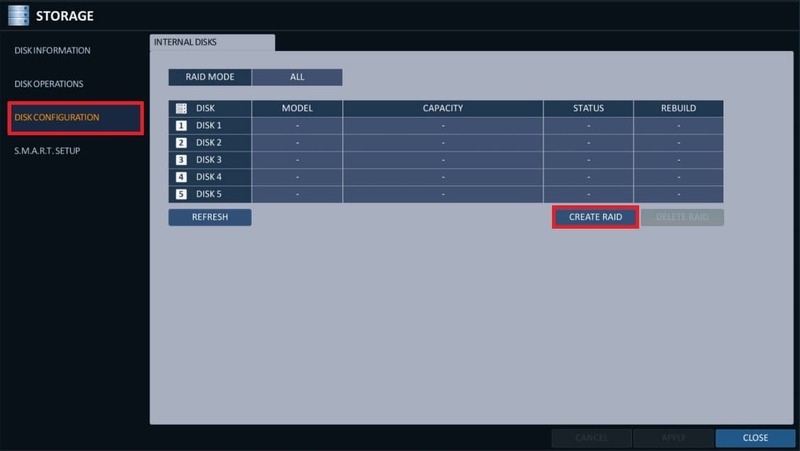 By default the iDVR-PROH comes set in RAID 0 which simply means the video just records and there is no option for any sort of recovery if a hard drive fails. RAID 0 writes to the hard drive much faster so playback is available seconds after it happens. When should I use RAID 0? In applications where video recording reliability is less of a concern and speed is important. 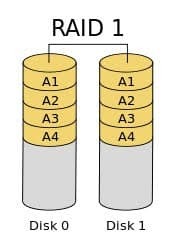 RAID 1 is used for redundancy, in order to run RAID 1 you will need at least 2 Hard Drives and you lose one Hard Drive, since it will be used as the “backup drive” (eg. If you have (2) 1 Terabyte Hard Drives you will only have (1) terabyte worth of video recordings). RAID 1 unlike RAID 0 runs at a much slower writing speed since you are not only recording to one drive, it will be copying info to both drives. Another thing to note when RAID 1 is recovering from an issue it typically slows performance, it is recommended to stop recording when a drive is being recovered to help with performance. See reference image below. 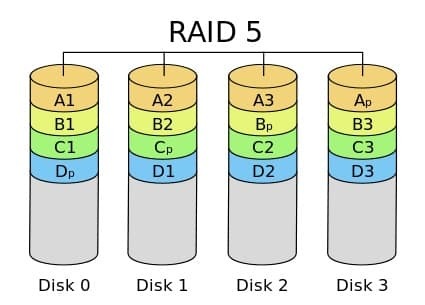 When should I use RAID 1? For applications where data redundancy is required. NOTE: There are cases where both drives fail and it is possible to lose both drives. In this case you will not be able to recover video footage. RAID 5 uses striping and parity to achieve fault tolerance with improved read speeds. You will need at least 3 drives and lose the equivalent of 1 drive worth of storage to the parity copy on each drive. Each drive in the array puts aside a portion of itself for parity. In the event of a drive failure, the array will be used from each of the drives to recover the lost data. When a drive is failing performance is typically reduced until the failing drive has been replaced. See reference image below. When should I use RAID 5? For applications where a more balanced approach is required, RAID 5 offers efficient storage, good performance and failure resistances. This topic was modified 1 week, 2 days ago by James Haldas.